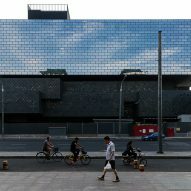 These new photographs by Yueqi Jazzy Li reveal the "pixelated" forms of the Guardian Arts Center by Büro Ole Scheeren as it nears completion in Beijing. Scheeren's architecture firm unveiled the new headquarters for the country's oldest art auction house, China Guardian, in mid-2015. Conceived as the world's first major museum and auction house hybrid, the arts centre provides two large auction halls, as well as a proposed 1,700-square-metre exhibition and event space, and a 120-room hotel. China Guardian's new headquarters are located two blocks from Beijing's Forbidden City – the Chinese imperial palace that dates back to the Ming dynasty in the early 15th-century – and a modern shopping centre. Li's images depict the contrast of the historical context of the old city aside the commercial properties that have sprung up around modern Beijing. The building's lower half is made up from staggered blocks of grey stone, while the top half, a glass brick rectangular "ring", houses the arts centre's hotel. "The diagram of an elegant glass volume floating above a series of stone-clad intersecting boxes reads quite nicely against its immediate context in Beijing, which includes a hodgepodge of functional modern, Chinese post-modern, and vernacular Hutong buildings," Li told Dezeen. The contrast between the area's historic legacy and the increasingly modern surrounding architecture was a main focal point in the development of the project. "It explicitly pays respect to its context and location but also comes to embody the nature of an auction house at the intersection of culture and commerce," said Scheeren when the project was first unveiled. 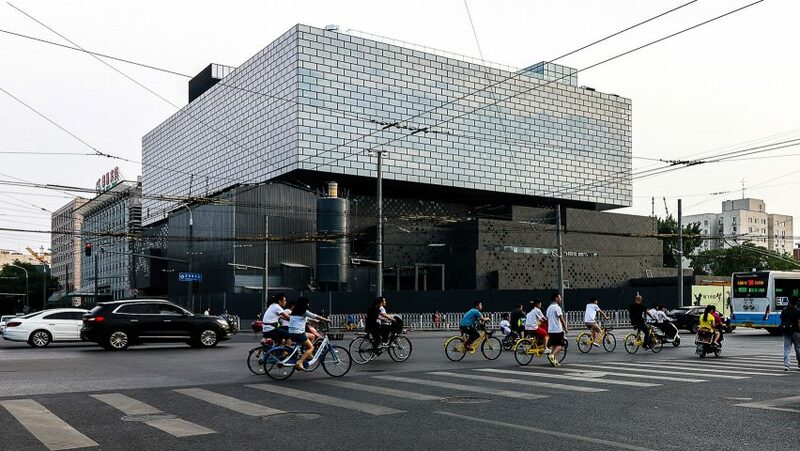 "[The building] holds special significance to China – at an intersection of two streets, and two worlds: Beijing's most famous commercial street Wangfujing and Wusi Dajie, the site where the New Cultural Movement originated after the Qing Dynasty," he added. 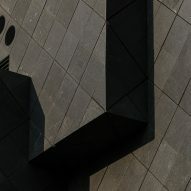 Details in Li's photographs show how Scheeren has attempted to articulate this connection through the irregularly staggered forms of building's lower half – which were intended to reference the contemporary architecture of the Chinese capital. 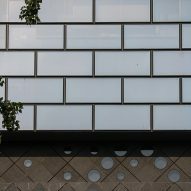 "Its running bond pattern vaguely refers to the brick walls of the hutong houses while cleverly hiding the all too apparent reading of a spandrel, typical on curtain walls," said Li. 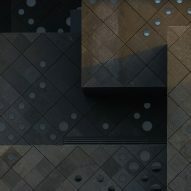 "As a result, the wall achieves a scaleless quality that is rather appealing and unique in this part of town." The lower half of the building is perforated by numerous circular windows that together are intended to recreate one of China's most important historic landscape paintings, Dwelling in the Fuchun Mountains by the artist Huang Gongwang. 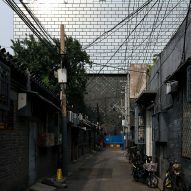 Li's images capture the reflection of the Beijing sky in the glass bricks that form the top half of the arts centre. 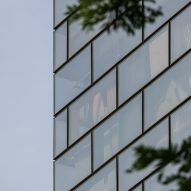 The contrasting textures used in the centre's facade show the various effects light plays on the building – reflecting the clouds in the mirrored glass, while casting shadows across the overlapping blocks of grey stone that jut out of the facade. Other architectural projects captured by Li include Tadao Ando's concrete and glass theatre in Shanghai, through which two large tunnels are carved, and the monumental forms of IM Pei's Museum of Islamic Art in Dohar, Qatar.